The M'LIS Company will donate $1 for every inch lost to Mothers Without Borders--an organization working to send a message of hope to orphaned children around the world. So, whether you're into fitness, into wellness, or just looking and feeling great for the holidays, there has never been a better time to get started with M'LIS Body Contour Wraps. *For those of you who want to take your body contour wrap results to the next level, get started on the 10 day cleanse or the 24 day challenge program. 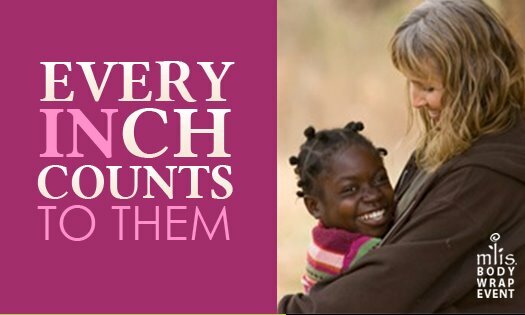 We will match your efforts by donating a $1 for every pound lost to Mothers Without Borders. So for every inch lost the M'Lis company will donate a $1 and for every pound lost we will donate a $1. Book your Body Contour Wrap Today and/or get started on the 10 day cleanse program or 24 day challenge program. Every inch and every pound counts for them! NO MATTER WHAT YOU'RE INTO, A M'LIS BODY CONTOUR WRAP AND OUR NUTRITIONAL PROGRAMS CAN HELP YOU LOOK AND FEEL GREAT.